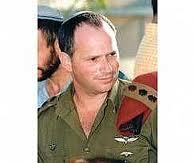 I remember the very sad day during the 2nd Intifada when I heard that legendary Colonel Dror Weinberg had been murdered leaving behind 5 young children and a pregnant wife, so I was so moved to see this week that Weinberg’s oldest son has grown up to follow in his father’s illustrious footsteps. Make sure to watch some of the video below in which Weinberg’s children talk about their father z”l. Yoav, Dror’s oldest son, was 15 years old when his father was killed. From early childhood he dreamed of following in his father’s path as a soldier. At the age of 22, after he finished his studies at the Ayelet HaShachar Yeshiva in Eilat, Yoav joined the army and was accepted by the unit with which his father was so identified- Maglan. Like his father, young Weinberg stood out as one of the unit’s outstanding soldiers. Yoav is married with 3 children, the youngest of whom was born this summer when he was completing the commander’s training course. Yoav entered his new position the same week that the army set up a memorial in his father’s honor to mark the 10 year anniversary of his murder.